St. Ambrose rentals: Lorraine Ave.
St. Ambrose Housing Aid Center, Inc. is an Equal Opportunity Employer. St. Ambrose complies with HUD’s regulations in 24 C.F.R. Part 135.38 which implement section 3. The purpose of section 3 is to ensure that employment and other economic opportunities generated by HUD assistance or HUD-assisted projects covered by section 3, shall to the greatest extent feasible, be directed to low- and very low-income persons, particularly persons who are recipients of HUD assistance for housing. 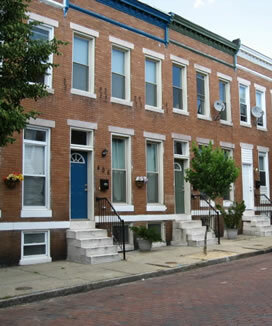 The mission of St. Ambrose Housing Aid Center is to create and maintain equal housing opportunities for low- and moderate-income people, primarily in Baltimore City, and to encourage and support strong and diverse neighborhoods. St. Ambrose Housing Aid Center is seeking a dynamic individual to manage its Resource Development Department. Overall responsibility for planning, directing and implementing agency resource development activities with a focus on obtaining charitable gifts and grants. This position manages the organization’s public image including brand management, public relations and communications. The position also supports organization-wide strategic planning and program evaluation. This is a senior position in the organization. Able to work under pressure of many priorities and deadlines. This position normally requires the physical demands of standing, walking, bending, lifting or performing other work requiring medium exertion, talking, and hearing on a regular basis to perform the job requirement. These physical demands are required up to 85% of the time. Salary commensurate with experience. This is a full time position plus benefits. St. Ambrose Housing Aid Center is seeking a dynamic individual to manage its Rental Services Division. Supervise St. Ambrose’s maintenance and property management personnel and functions. The successful candidate will need to be able to oversee a complex program; supervise a diverse workforce; prepare and implement budgets; maintain accountability for budget targets; create and implement property improvement plans; work proactively with advisory and oversight committees and the Executive Director; participate on the senior management team to set priorities, staffing, budget and work plans and define future directions for the department and organization; possess enhanced leadership skills and experience to motivate and obtain optimum results from staff and volunteers. Knowledge of property management software; Knowledge of Real Page a plus. Strong knowledge base and familiarity with building systems and maintenance procedures. Bilingual, especially Spanish speaking a plus. St. Ambrose is looking for a Junior Asset Manager to join its team. The candidate will assist the Director of Rental Services in monitoring an affordable multifamily portfolio to evaluate financial performance and ensure compliance with, among other things, affordability and reporting requirements. The candidate will work with team members, borrowers, legal counsel, production teams and others within St. Ambrose to ensure superior customer service is being provided. Assist in monitoring and managing a portfolio of affordable properties from initial closing, during construction and through the operational phase. Complete a monthly review of the financial performance of the portfolio including a review of financial statements, rents rolls and delinquency reports for each of the properties. Review delinquency reports and progress updates with mangers. Assist in ensuring compliance with reporting and affordability requirements. Assist in the recapitalization and renovation planning and implementation from underwriting to closing. Run and review financial and management related reports from RealPage. Assist in the development of property budgets. Provide analytical support to the Director and members of the department on a wide variety of assignments as needed. Assist in the review, preparation and processing of replacement reserve requests. Risk management activities involving real estate taxes, insurance, escrows, and reserves, among other things. Attention to detail, take initiative to continually improve the integrity of portfolio information and meet capital source reporting deadlines. Special Projects and other ad hoc requests. Maintaining compliance with requirements within loan documents, regulatory agreements and other property related documents. Prepares and files information and reports as needed. Computer proficiency with a strong working knowledge of Microsoft Excel, Word, Outlook. Familiarity with management and accounting software. Includes meetings, driving, climbing stairs and walking to/from rental properties.